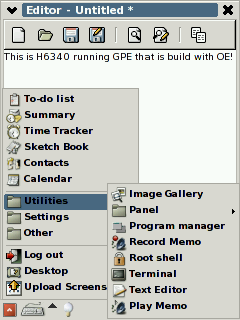 This page contains detailed instructions of all of the steps required to install the GPE Linux image from the Familiar distribution to your h63xx device from the pre-built images. The image is build by using the openembedded (OE) build system. For further information see http://familiar.handhelds.org and http://oe.handhelds.org. 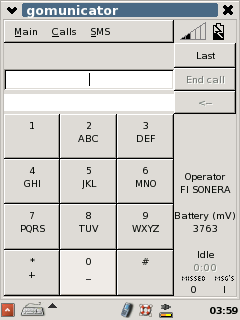 The HP iPAQ h63xx series of devices offers you the possibility to install an open-source version of Linux to your phone either from via binaries or by building it yourself. Most of the peripherals including the phone are now functional. memory suspend by using /sys/power/state interface after a certain amount of in-activity (must be able to also notice certain hardware activities even if user is not pressing keys or screen). I have still not a clear picture whether we could use PM-utils, or acpid, change the apmd to work also with non-apm interface Linuxes or write new application. So far any of the apps available has not looked good enought for our use cases. The current bootsystem uses a two phase bootloader. This means that we need to first boot WinCE and launch an application called "wililo.exe. This will load and start the second phase operating system independent bootloader that will take care of loading and executing the Linux kernel image. As storage media for the bootloader and Linux files, we are using either MMC or SD cards instead of flashing Linux over the WinCE system. This allows you to use Linux in parallel with WinCE. You can get back to it from Linux by doing a hard reset that will load WinCE from the flash memory. As a hard reset will reset all user data, it is recommended that you backup your data by using the "backup/restore" application before booting to Linux. Desktop Linux or a bootable CD For installing and building applications for the H6300. MMC/SD Card The 512 MB SD card is the recommend one, but in addition we have tested various other MMC/SD cards with sizes between 128MB and 512 MB. It is also possible to load the rootfs from desktop linux by using NFS. MMC memory card reader (USB connection) Required for partitioning the MMC card to VFAT32 and Ext2 partitions in desktop Linux. Usually the MMC memory card reader is connected to the computers USB port. Costs around 20 - 40 euro/dollar. I have for example USB based Lacie 8-in-1 Reader which costs about 20 euro and supports MMS, SD and Secure SD cards. H6300 USB Cradle The cradle which comes within the H6300. The TCP/IP communication between H6300 and Desktop Linux can be established over this cable. The following are the files you need to download for a succesful build. Contains the latest versions of the bootloader and Linux rootfs-files. Both of them have been packaged to their own tar.bz2 files inside this file. 2) Check what node names Linux has already reserved to USB/SATA devices. the card as a USB memory stick. - Linux should automatically detect and mount the newly inserted USB memory card. 4) Check what /dev node name Linux is now using for the newly inserted SD/MMC card. card. Otherwise some of the already exising /dev node names are propably used. This should now give you a following information revealing that /dev/sdd is used as a MMC or SD card. Keep the MMC card in the card reader but unmount it if your Linux distribution has automatically mounted the card paritions. "remove" on the gnome desktop. Unmount needs to be done to allow the re-partitioning of the card. - Change to root user and open fdisk with command "fdisk /dev/sdd"
2) Verify that the new FAT32 and EXT2 partitions were created. - "mkfs.vfat -f 1 /dev/sdd1"
To be able to copy the files required for booting the H6300 you need to mount the FAT32 and EXT2 partitions. In this example we assume that the FAT32 partition is mounted to /mnt/removable and EXT2 partition is mounted to /mnt/removable1. Configuration file for defining different bootloader options. After FAT32 and EXT2 partitions has been mounted to your Linux desktop, you can start copying the bootloader files to your FAT32 partition. It can be done easily by extracting the files from the h6300_linux_bootloader.tar.bz2 to FAT32 partition. Boot options offered by wililo are configuable via wililo.cfg. Once wililo is launched, it reads wililo.cfg and uses information represented in there to create a list representing different boot possibilities. second partition (ext2) of your MMC/SD card. set command "noinitrd root=/dev/mmcblk0p2 rw console=tty0 mem=64M at 0x10000000"
Following command could be used for example be used for mounting the rootfs from the nfs partition available in your desktop computer. set command "noinitrd ip=192.168.2.2:192.168.2.1:192.168.2.1:255.0.0.0:h6300:usb0: root=/dev/nfs nfsroot=192.168.2.1:/ipaq_rootfs mem=64M at 0x10000000"
The GPE files are available in the h6300_gpe_image_rootfs.tar.bz2 that can be extracted from the h6300_gpe_image*.tar.bz2. The rootFS contains all the files needed by the Linux distribution. After you have copied all files to Fat32 and Ext2 partitions, you are almost ready to boot to Linux. - NFS for booting from the NFS partition in your Linux desktop. Recommended for development purposes. See chapter dedicated for this below. note: Boot process has some hardware initialization problem which is why the step between 3 and 4 does not always work reliably. You know that the boot process has failed if the Linux console text does not start to appear in the console after 30 seconds after the "Booting to Linux" text. In such a case you should just reset the h6300 and try to boot again. after building them over the SSH connection for example. 3) Once the boot starts, the device reserves an ip address 192.168.2.2 for the USB0 interface. --> USB0 interface routes traffic over USB cable. Therefore the Linux in the desktop must also be configured in such a way that it will take the USB0 interface for itself dynamically. 6) When the h6300 boots and establish the USBNET connection, ifconfig command should display you something like this if executed as a root user. 1) Remember to unmount the MMC/SD card partitions after you have copied or extracted files to MMC/SD partitions. The unmount will make sure that files are really synced correctly from the cache to the partitions. made things work a little bit better. b) Hold down the 'email' and 'contacts' buttons before the tmobile screen appears. ---> you should then see "BL" in bottom left hand corner. In addition of using graphical wililo.exe it is also possible to use other non-graphical bootloaders available in our svn repository. This bootloader can be used if user does not want to see the graphical menu offering various boot options. Parameters used for booting can be configured from the configuration file. investigating the state of the various registers when the device is used. This can be very usefull when you try to find out how certain hardware works in order to write a driver for it. and for loading the kernel over the USB cable to device before booting to Linux. For the development the fastest method to work is by mounting rootfs from the NFS partition. Launch application over SSH connection --> Application is displayed in your desktop Linux and you can use keyboard and mouse for testing app. Following are the most important configuration files and locations in the GPE rootfs image available for the h6300. Most of these files are already configured ok in the rootfs image. /etc/resolv Nameservers ip address. ppp/GPRS scripts are able to update the nameserver and routing information automatically once the connection is established. /etc/profile.d/tslib.sh File that need to be executed for enabling the touschreen to work. /usr/share/tslib/ts.conf-h6300 h6300 specific touschreen configuration file. Ringing tone used by gomunicator for alarming from the incoming call. Hopefully somebody would have time for replacing with the tremour based ogg player code in the future.